While perusing the interwebz yesterday, I stumbled upon an interesting post about one of the few TV shows that I watch consistently. I found this post on one of my favorite blogs, i.e. The Droid You’re Looking For, a movie and TV related website by our buddy John LaRue. 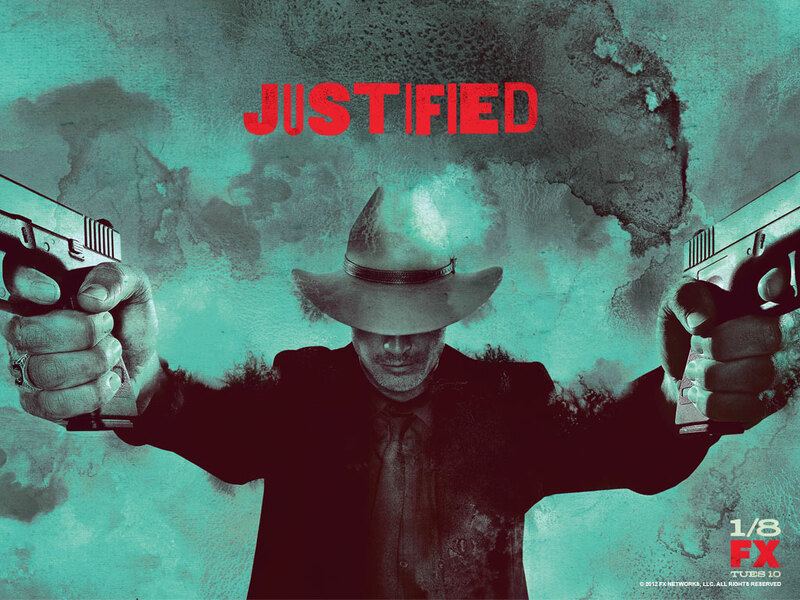 The TV show is called Justified and it airs on the FX Network (season 4 began on January 8th). If you watch the show on a consistent basis, then you are already aware that Bourbon and various other alcoholic beverages are featured quite prominently throughout each episode (they also talk a good bit about illegal oxycodone trafficking and other illicit drugs, but we’ll gloss over that bit of nastiness). They even go so far as to ask for their favorite Bourbons by name. Jim Beam, Blanton’s, and Pappy Van Winkle are just a few of the whiskies that have been mentioned over the show’s four season run. Bourbon. Moonshine. Apple pie moonshine. These are all tasty alcoholic beverages if you’re in Kentucky. They’re especially great beverages if you’re in Harlan County, Kentucky as it’s portrayed on the FX network show, Justified. If you’re not in Harlan County, I’ve discovered a way to magically transport you there. 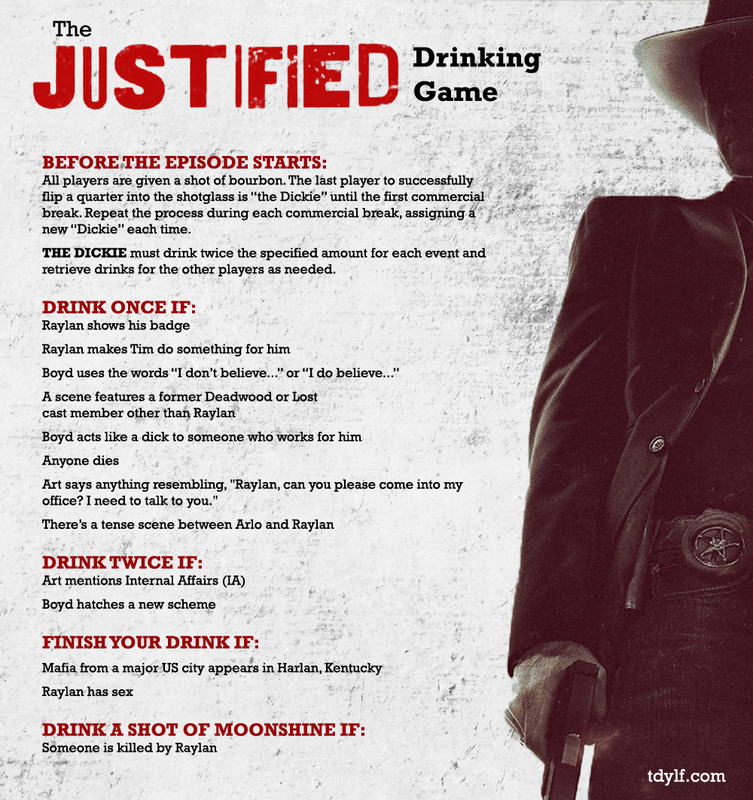 Simply watch Justified and play this drinking game with your family, friends, significant others, pets, and fellow degenerates seeking an excuse to get drunker than a Harlan citizen on payday. Thanks to John’s creativity, I may have to hold off on watching the show on Tuesday nights and instead watch it on a Friday or Saturday night so that I can play along without having to worry about getting up for work the next morning! Do any of you watch Justified? I’d love to hear your thoughts in the comments below about this highly entertaining and thirst inducing TV series. I wish I could take credit for this, but it’s all John LaRue’s doing. The guy is super creative! Funny as hell too. I’m sure you could come up with drinking games for other shows. What do you watch on a regular basis? Would a Mad Men drinking game be too obvious? Or perhaps it would just result in too many Monday morning hangovers. The new season starts in April! Isn’t just watching Mad Men already a drinking game? I can’t watch an episode without a glass of whisky nearby! lol. April … awesome! That is a very good point. The same applies to Justified. I just have to have a glass of whisky when I watch that show. Preferably American.